Tangled Feet* Raises evasion if the Pok�mon is confused. This Pokemon's Evasion rises when it's Confused. 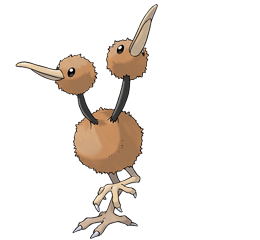 this POK�MON runs at high speed on developed legs. rare occasions, there will be examples of this POK�MON possessing different sets of brains. Emerald Even while eating or sleeping, one of the heads remains always vigilant for any sign of danger. When threatened, it flees at over 60 miles per hour. FireRed A two-headed POK�MON that was discovered as a sudden mutation. It runs at a pace of over 60 miles per hour. Leaf Green A bird that makes up for its poor flying with its fast foot speed. Leaves giant footprints. Diamond/Pearl The brains in its two heads appear to communicate emotions to each other with a telepathic power. Platinum The brains in its two heads appear to communicate emotions to each other with a telepathic power. Heart Gold By alternately raising and lowering its two heads, it balances itself to be more stable while running. Soul Silver It races through grassy plains with powerful strides, leaving footprints up to four inches deep. Black The brains in its two heads appear to communicate emotions to each other with a telepathic power. White The brains in its two heads appear to communicate emotions to each other with a telepathic power.